Cohn also wrote “Neil Gorsuch and the Deconstruction of the Administrative State,” in which she writes: “When Donald Trump’s chief of staff Reince Priebus addressed the Conservative Political Action Committee in February, he identified two priorities of the administration: the confirmation of Neil Gorsuch to the Supreme Court, and deregulation. 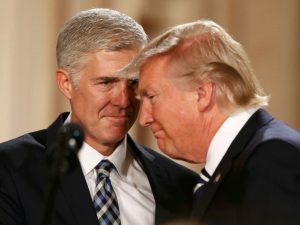 “It turns out that elevating Gorsuch to the Supreme Court and achieving deregulation are inextricably linked. “During Gorsuch’s confirmation hearing, Democratic members of the Senate Judiciary Committee challenged him on his pro-business positions.